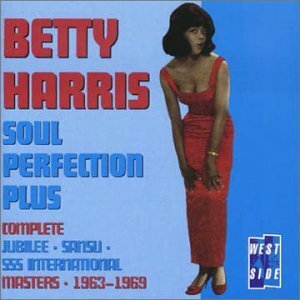 Listen to Betty Harris on Another Break in the Road and Mean Man and with Lee Dorsey on Love Lots of Lovin'. Although she hailed from Florida and never even lived in New Orleans, the twenty gems that Betty Harris cut for Crescent City studio swami Allen Toussaint during the '60s are unparalleled in the realms of the city's funky soul continuum. Ever since she retired—in 1969 at the height of her career—her records have been slowly amassing a cult following among DJs, fans and music freaks not unlike the underground legacy that slowly built around Howard Tate prior to his recent comeback. While her mysterious whereabouts and brilliant discography have led to a mountain of speculation and distortions of the facts, the truth is that she just recently began performing again after taking three decades off to raise her family and live a quiet existence away from the music business. Born in Orlando in 1939, Harris was raised in a strictly religious household—both her parents were ministers—where rhythm and blues was frowned upon. She began singing in church and by her late teens had sought out her idol Big Maybelle, who agreed to take her on the road as her protégé. Harris attributes her awesome vocal power to Maybelle's rigorous coaching; certainly her gospel background was a solid foundation. She cut her first record for the Douglas label in 1962 before crashing the charts in '63 with her biggest hit, a slowed-down, soulful reworking of Solomon Burke's "Cry To Me," produced by the Bert Berns with Jerry Leiber and Mike Stoller sanding at the ready. All in all, Harris waxed eight sides for the East Coast team, her final release, "Mojo Hannah"—a slice of Louisiana-style soul penned by Andre Williams and recorded unforgettably by Crescent City soul queen Tami Lynn—seemingly forecasting the fact that she was about to shake New Orleans to its very core. Harris met Toussaint in 1965 and the pair produced the very first disc on Toussaint's brand new Sansu imprint, "What A Sad Feeling" b/w "I'm Evil Tonight." While the producer was certainly at the zenith of his career at the time that he was flying Harris in for her sessions, even among the likes of label mates like Lee Dorsey, Diamond Joe and Curly Moore her records stand alone. Toussaint seemed to take extra care with his craft when working with Harris; seemingly an indication that in her he'd found someone that he could truly develop into a star. From the mesmerizing "Bad Luck" to her smokin' version of "Ride Your Pony" (a hit for Lee Dorsey) to her final testament, the nearly apocalyptic "There's A Break In The Road," Toussaint unwittingly cast Harris in the role of a dyed-in-the-wool New Orleans soul legend. Ever since her retirement she's been one of the city's most sought after missing musical links. "Betty Harris left a legacy of soul vocals that rival any of her contemporaries for complexity, imagination and pure soul."